Awesome Friday! 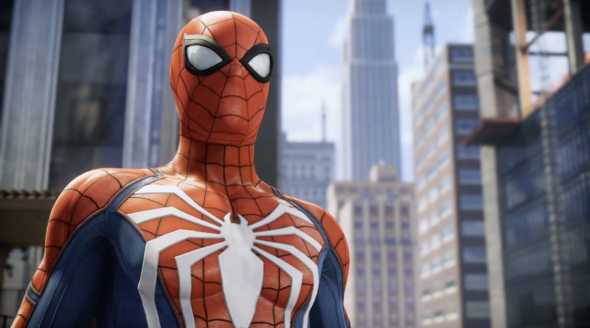 » Blog Archive The new 'Spider-Man' game looks kinda great - Awesome Friday! I’m tentatively excited about a game. That hasn’t happened in a while. Let’s take a look. Let’s get this out-of-the-way: that’s a terrible suit. I don’t think it’s as bad as a lot of people I know do but it definitely isn’t good. I actually like the details on the knuckles and I am ok with the red to blue ratio, and even the flourishes of white on the arms, but the big white spider is just…. well it’s something anyway. On the good news front: this looks really fun! The combat looks very Arkham Asylum to me but rhythm based combat seems like a really good fit for Spider-Man to me, too. I love that the environment is interactive and I wonder how complex those interactions can get. Can you web on to a throwable item and whip it at one goon while you’re kicking another goon in the face? In any event I still don’t even have a PS4, but then again this game has been delayed until 2018 so I will have plenty of time to keep pondering getting one. This game might be a pretty big incentive to do that, too.